Our most commonly held formula for success is broken. Conventional wisdom holds that if we work hard we will be more successful, and if we are more successful, then we'll be happy. If we can just find that great job, win that next promotion, lose those five pounds, happiness will follow. But recent discoveries in the field of positive psychology have shown that this formula is actually backward: Happiness fuels success, not the other way around. When we are positive, our brains become more engaged, creative, motivated, energetic, resilient, and productive at work. This isn't just an empty mantra. This discovery has been repeatedly borne out by rigorous research in psychology and neuroscience, management studies, and the bottom lines of organizations around the globe. 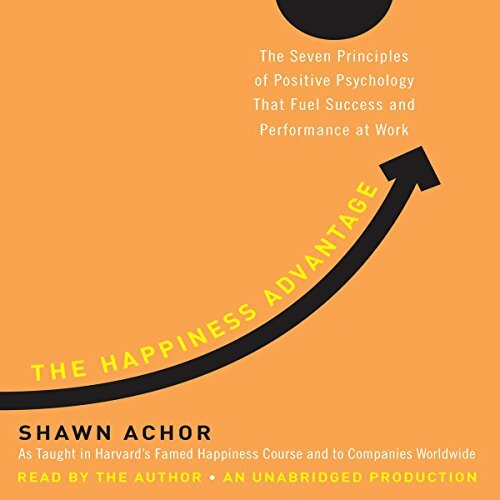 In The Happiness Advantage, Shawn Achor, who spent over a decade living, researching, and lecturing at Harvard University, draws on his own research-including one of the largest studies of happiness and potential at Harvard and others at companies like UBS and KPMG - to fix this broken formula. Using stories and case studies from his work with thousands of Fortune 500 executives in 42 countries, Achor explains how we can reprogram our brains to become more positive in order to gain a competitive edge at work. Isolating seven practical, actionable principles that have been tried and tested everywhere from classrooms to boardrooms, stretching from Argentina to Zimbabwe, he shows us how we can capitalize on the Happiness Advantage to improve our performance and maximize our potential.